The Box Tops were an American rock group active in the 1960s. 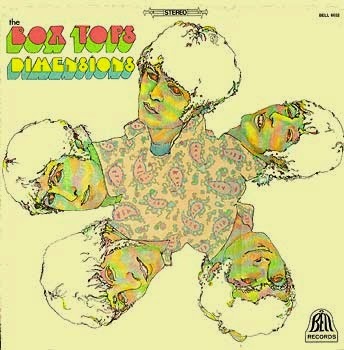 The Box Tops had scored five Top 40 hits in 1967 and 1968, with songwriter Dan Penn working as their producer at Chips Moman's American Sound Studio in Memphis. However by late '68 Penn had stopped working with them, and their production duties were taken over by Moman and Tommy Cogbill. Lead singer Alex Chilton was also starting to get disillusioned with both The Box Tops and the music business as a whole. Only Chilton and guitarist Gary Talley remained of the original group, and regardless of who was in the group at the time Chilton was usually the only one to appear on the recordings, alongside the American Sound house musicians. They had another hit in late 1968 with "Sweet Cream Ladies, Forward March", which got to #28. The next summer they had their final hit, with Wayne Carson Thompson's "Soul Deep", which got to #18 (a fantastic catchy pop song, it's still one of their best known numbers). Their fourth and final album was released the same year. For Dimensions the band wanted more creative control, and so it featured a few Alex Chilton originals. Alongide the last two hits it also featured a cover of Bob Dylan's "I Shall Be Released" and a long blues jam of BB King's "Rock Me Baby" (actually the second time their had recorded it, as it also featured in a shorter arrangement on Non-Stop). It was another fine album, a great mix of rock, pop and R&B sounds. However following its release the band broke up, as both Chilton and Talley moved on to new things. Recordings continued to be released under the band name, and a new group was actually put together to keep the name alive (it was not retired until 1974, but no more albums were released).